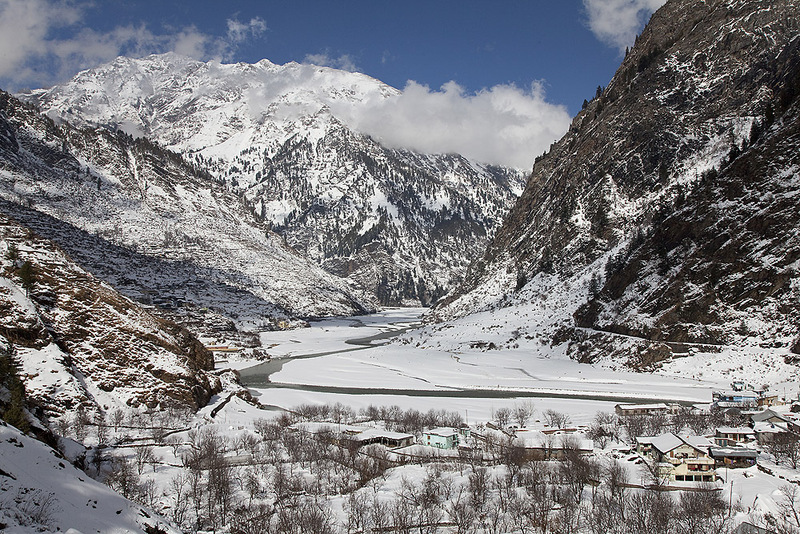 The Bhagirathi River snaking it’s way North towards it’s source at the Gangotri glacier 46km away. This was as close to the source as I was able to get (you can find out why in the previous post). This was shot from the village of Jhala and where the journey down the Ganges river is to start. From here I’ll be following the route of the Bhagirathi stopping at the villages and towns of Bhuki and Uttarkashi and then continuing to Devprayag where the river meets with the Alaknanda to form the Ganges proper. From there my planned route is to then stop again at Rishikesh and then move onto the pilgrimage town of Hardiwar. From there I’ll be moving out of the mountains and onto the plains of the Ganges where my stop offs will be Lucknow, Allahbad and the most holy city of Varanasi – this will be my third visit here. From there I’ll be stopping at the Buddhist town of Bodhgaya and then onto Calcutta (my first visit here) and then to Sagar island where the Hindus believe the holy river ends. From there I’ll then be crossing into neighbouring Bangladesh to spend some time documenting the boat yards of Chittagong. I hope you’ve enjoyed the images so far and I’m sure there’ll be many more to follow.